There’s no question that David Tennant is a very talented actor. He’s had a role in “Harry Potter and the Goblet of Fire,” is currently in the third season of “Broadchurch” on BBC, has been a beloved Time Lord in “Doctor Who” (BBC) and is currently the voice of Scrooge McDuck on Disney’s “Duck Tales” reboot. When the Scottish born actor appeared on “The Late Show” with Stephen Colbert, these accolades were of course discussed. However, it’s the final bit that is absolutely hilarious as Tennant read quotes that could be from either Donald Trump or Scrooge McDuck. The former “Doctor Who” star discussed his “Broadchurch” costar, Jodie Whittaker and her next adventure as the first female Doctor on the series. 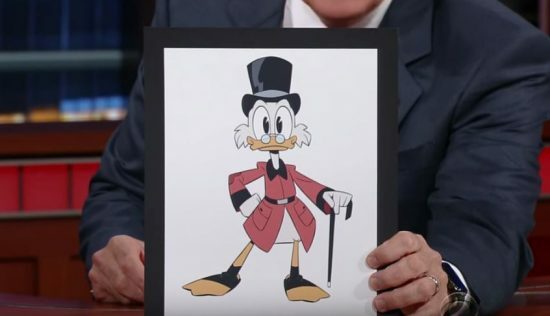 “One of the things we’ve noticed about Scrooge McDuck, is that he is a billionaire tycoon who has his name on a lot of brands and employs a lot of family members. And that sounded familiar to us,” said Colbert. As both individuals have similar personalities and situations, the gag was both timely and entertaining. Tennant’s natural accent, being a perfect match for the wealthy Disney duck was all the more amusing when quoting Trump. “DuckTales” premieres on Disney XD with a 24-hour event starting at midnight on Saturday, August 12.